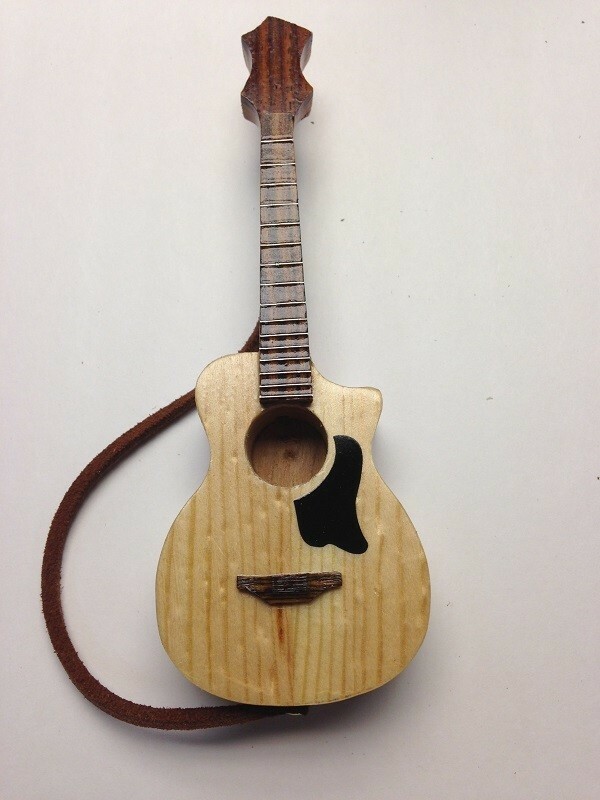 This model is the smaller version of the acoustic line of guitars that are offered by Smoking Hot Guitars. This by no means makes it any less cooler than all of the rest. It sports the same attention to detail as all of the other models . It's features includes a quartersawn, bookmatched spruce top ( as all good guitars should have) and a rosewood bridge and fingerboard with individually inlayed frets (to scale). The main body is constructed of domestic black cherry which has been the wood of choice for the pipe industry for many years. Many of the original "vintage" tobacco pipes used cherry for its aromatic qualities. It has proven itself as on of the more popular woods for pipes and works well with all tobaccos and herbs. Each Smoking Hot Guitar is built by a proffesional luthier and comes with a serial# and a certificate of authenticity.